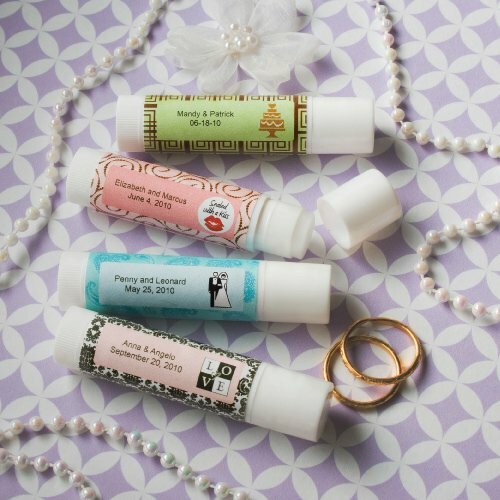 Sometimes it's the little things that pack a big punch, and these personalized lip balm wedding favors (chapstick style) certainly fit the bill! Filled with vanilla-flavored lip balm with a twist-type bottom, each 2 3/4" by 5/8" diameter tube comes with a personalized label that you design during checkout! Note: Minimal assembly is required to remove the plastic wrap and adhere the labels to each favor, lip balm sticks arrive bulk packed. Do you have to get the chapsticks in a variety of colors or can you designate it as one color? You can have different colors/design of the chapsticks but you need to enter it separate times in your shopping cart. I'm sorry we do not sell the labels separately. The labels are included when you purchase the lip balm. Do the Lip Balms contain SPF? I'm sorry, they do not have an SPF. Can I not upload my own logo to these lip balm favors? At this time, we cannot add a logo on these Personalized Lip Balm Wedding Favors - Chapstick Style. You have to pick from the designs on the website. I need to know the total ingredients list in your Chapstick‘s lip balm. The ingredients of the Personalized Lip Balm Wedding Favors - Chapstick Style are the following: Mineral Oil, Candelila Wax, Petrolatum, Cera Carnauba, Caprylic/Capric Triglyceride, Ceresine Wax 4511N, Polybutene, Refined Shea Butter, Tocopheryl Acetate, Propylparaben, BHT, Fragrance. Hi, I am working on a customized chapstick. If I choose not to use a design, will the text be centered? No, the text would appear as a blank space due to the templates that are used when you won't choose a design and unfortunately, it can't be changed. I'm trying to purchase 100 sets, i see they come with a thank you card attached, Would i be able to change it? Unfortunately, the Beach Theme Starfish Wine Set Favor can't be personalized but we sell a personalized hang tags that you can attach to it, click here. Can you show me a picture of how the wedding favor lip balms will look? After adding it to your shopping cart, you can click on the Personalize Now tab. That's where you design the label of the Personalized Lip Balm Wedding Favors - Chapstick Style and see how it looks like. I’m trying to place an order. Are these labels only or are they chapsticks with personalized labels? 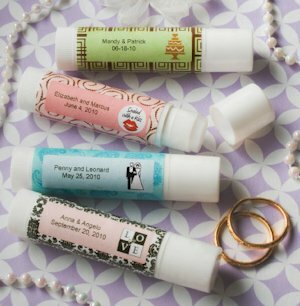 The Personalized Lip Balm Wedding Favors - Chapstick Style are vanilla-flavored lip balm with a twist-type bottom. Each 2 3/4" by 5/8" diameter tube comes with a personalized label that you design during checkout. Hello, do the customized chapstick style labels come already on the lip balms? Yes, the Personalized Lip Balm Wedding Favor Chapstick Style includes the label but some minimal assembly is required, you need to remove the plastic wrap and adhere the labels to each favor as the lip balm sticks arrive bulk packed.